Here's an update to Jabari's story. We left the original story below the update to show how God has brought him a long way. First let me start by saying , Jabari is an amazingly strong young man who has captured the hearts of many on his journey. The numerous people that have met him, have been touched by his undying faith that he will receive his heart. He doesn't talk with sadness but expresses things that he's going to accomplish once he's out of the hospital. He has so many plans for his future that it's breathtaking to hear him speak about them in his conditition. Jabari has been transfered from ICU to CCU at Emory , which means he's drawing near to receiving a heart. He has been surrounded by people that only God has placed in his life. To witness the Love from the staff at St Joseph's and the care he'd received was only orchestrated by the hand of a merciful God. Now being moved to Emory in CCU, another incredible staff has surrounded him with buckets of compassion and Love. People from all walks of life loving on him and identifying with his challenge, but never letting him entertain the thought of doom. It has only been encouragement. All of the people that Jabari has encountered have been a vital part of his journey and continue to support him. We still need your help with funding the enormous medical bills that are still mounting. 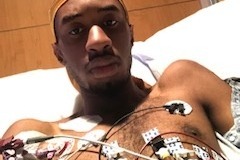 Only through your graciousness of donations will help with the funding of Jabari's new heart and deflate some of his medical bills. We implore you to help with a most needed cause and appreciate your willingness to give. We have left Jabari's original story below so that you can understand where he started and how God is continuing to move him to the next phase. Jabari is an 18-year college student at Mississippi Valley State University. He came to visit his aunt in Atlanta for the Christmas holidays. He became very ill. He would later find out he needs a heart transplant. He doesn’t have any insurance and parents to support him. His only support is his aunt. Jabari is a very independent young man that doesn’t ask for help and has been on his own since he was 12 years old when his Mother passed. The Doctor’s advised that he needs a Heart within 3 to 5 months. With bill accumulating, his aunt and him need all the support they can get to raise money for medical expenses and for the heart transfer. He’s on a special diet and attends weekly Doctor’s visit. He’s on life sustaining medication that keeps him alive along with wearing a life vest 24 hours. We are seeking all the help he and his Aunt can get. If you donate to this cause, you would be securing this young man’s future goals and dreams.